We are delighted to invite you to the INSEAD alumni event to be hosted by DuPont at its Geneva Innovation Center on November 8, 2018, in Meyrin. 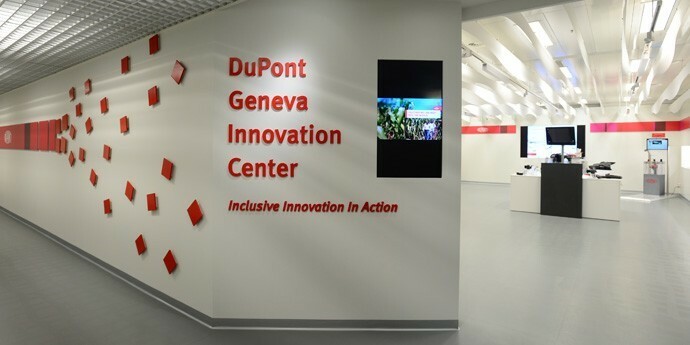 Explore DuPont Innovation Center: Meet its top executives for inspiring conversations! This is the place, where new ideas become a reality and the customer experience is enhanced by the “touch and feel” in the Innovation Space to showcase the breadth of solutions and connections between materials and different industries. DuPont’s network of Innovation Centers is designed for customers and strategic partners to collaborate and generate solutions to challenging problems. We will be welcomed with a presentation by Dr. Simone Arizzi, DuPont Switzerland Country Leader, Technology & Innovation Director EMEA, and we will also meet Alessandra Bonvini, DuPont Geneva Innovation Center Leader, followed by the Innovation Center tour and a networking reception. has a chemical engineering degree from the ETH (Zürich) and a Ph.D. in chemical engineering from MIT. In this role Simone defines the critical competencies, infrastructure footprint and portfolio initiatives to implement the Science and Technology strategy across the region. He develops and executes DuPont’s Open Innovation strategy with industrial partners, academic institutions and start-ups. Also, Simone acts as a Principal Consultant with external clients for DuPont’s Innovation Management Practice.Furthermore, since 1991 in DuPont, he led different roles, being responsible for technology globally in DuPont Photovoltaic Solutions and creating next generation of materials for PV applications that improve the efficiency, lifetime and cost of modules, thus accelerating the path to grid parity. In addition, he worked as Technology Manager in the Material Science & Engineering division of DuPont’s Central Research and Development, in Wilmington (USA) in the areas of alternative energies with a focus on fuel cells, new materials for photovoltaic applications, as well as renewably sourced materials for packaging applications. Also, he held a variety of technology and business management positions in the Lycra® and nylon Specialty Intermediates businesses in the US and Europe. has an engineering degree from Politecnico of Milan, holds this position for the last 5 years and is very passionate about it. She leads and fosters inclusive collaborations with all DuPont partners to create new projects as well positions the Center internally as a tool to support the businesses innovation developments based on maximizing the collective insights available, both internals – with DuPont technology and externals – with customers and markets, combining them to generate growth opportunities.Alessandra is with DuPont for 20 years covering different roles – starting from Product Manager to South Europe Sales Manager for Electrical Insulating Systems. Also, she covered marketing roles as Marine Industry Leader for Italy, the biggest world market for construction of yachts, cruises and ferries. In addition, Alessandra is a LEGO SERIOUS PLAY® certified facilitator and is building a Design Thinking Community to better connect DuPont to it’s partners’ Needs.